Hawkers co-founder Mazen Hajjar is a man never shy with his opinions. 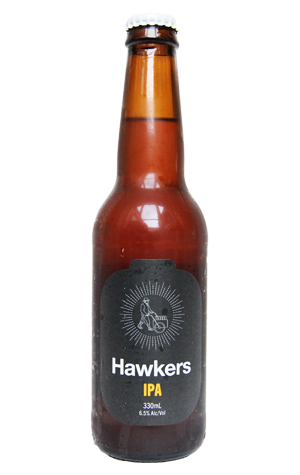 And among those many strongly held opinions is that his IPA is his favourite of the Hawkers core range. You can see where he's coming from; having stepped up the hop aromatics a touch from the first batch, the brewing team has ended up with a beer of both depth and sessionability. Based upon the same three hops as the pale, but within a very different structure, it possesses pleasant enough grapefruit, passionfruit and pine aromas, but it's once it's in your mouth that the beer's real qualities shine. The deep copper body offers enjoyable caramel and biscuit flavours but it's the layers of flavour from the hops that are the real star of the show. It's rounded off with a beefy but not boisterous bitterness and will likely become one of Australia's most fancied IPAs.